adobongblog: Food Experiment: flowers for dinner? 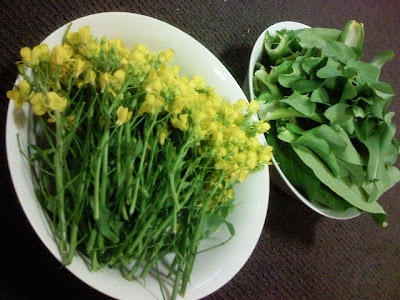 Food Experiment: flowers for dinner? I dropped by a friend's house in Churton Park here in Wellington some time back and when I was already about to go home, he proudly showed his veggie garden which was growing rather well. Pechay, lettuce, broccoli, potatoes... all were in the green of health, so to speak. He then proceeded to give me some of his pechay, which is usually harvested before they go full blast with their flowering but he did not need pechay for some time that they have decided to bloom in their summery finest. With the pechay on my arms that looked more like a bouquet than a bunch of leafy veggies, he informed me that pechay flowers are actually edible and can be cooked. His wife agreed with him. That's interesting. They said all I needed to do was wash it up, dry it out, saute it with garlic and a bit of oil real quickly, then add some soy sauce and some salt and pepper to taste. So back home, I separated the leaves from the flowers. The leaves will be used for nilaga. I removed the leaves with a bit of the stem on it; the rest were too tough for consumption and were disposed of in our biodegradable bin. 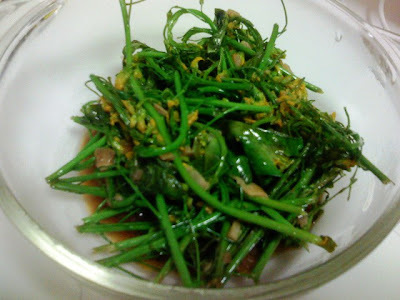 I quickly cooked the flowers as directed and came up with an interesting side dish. 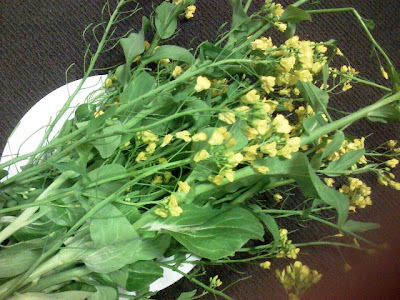 This actually reminded me of kangkong, but the pechay flowers are a bit bitter. I think I let it stay in the pan a tad too long. But still, it was a nice experiment and I promptly consumed the lot. On to the next experiment!